Met Éireann has extended a Status Red snow-ice warning for counties Dublin, Kildare, Wexford, Wicklow and Meath until 9am in the morning. The forecaster has said that snow accumulations are continuing to increase significantly due to further heavy falls of snow today. Met Éireann issued a Status Orange snow-ice warning for Munster, as well as counties Carlow, Kilkenny, Laois, Longford, Louth, Offaly, Westmeath, Cavan, Monaghan and Galway. It has also issued a Status Yellow snow-ice warning for counties Donegal, Leitrim, Mayo, Roscommon and Sligo. Storm Emma brought snow and high winds to many parts of the country overnight, with Munster, Leinster and Co Galway the worst affected. The ESB has said that more than 22,000 homes and businesses are currently without power, mainly in counties Dublin, Louth, Meath, Wexford and Cork. The ESB has said that at its peak, there were more than 125,000 homes, farms and businesses without power at around 1.30am this morning. It has said it is "unlikely" that they will be able to supply power to all customers today as a result of the conditions. 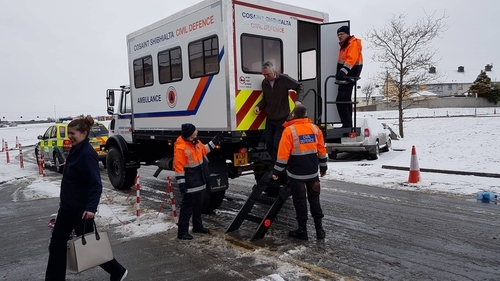 The National Emergency Coordination Group said in a statement that conditions will remain very difficult and have urged people to take great care as it remains extremely cold with accumulations of snow and ice in many areas. Group chairperson Sean Hogan has reiterated his warning to people to keep off the roads. He said it will take some time to get the roads safe and he said conditions will remain "very difficult and dangerous". Mr Hogan said that emergency services responded to a number of 999 calls last night. The Western region communications centre dealt with four calls, while the Munster Regional communication centre had nine calls. Dublin Regional communication centre had 62 fire calls and 214 ambulance calls. Coast Guard units, civil defence volunteers and defence forces assisted gardaí and the HSE by providing transport for essential healthcare staff. Local and transport authorities worked at full capacity and gritted 24,000km of roads and spread 6,000 tonnes of salt on primary roads and did so again throughout today. Taoiseach Leo Varadkar advised people to stay safe and said everyone needs to take account of local conditions before venturing outside. Following a meeting at the National Emergency Coordination Centre, he said they are monitoring the situation hour-by-hour and they are now looking towards the recovery phase, which will "take a few days". He said more than 200 snowploughs are out trying to clear the roads. Met Éireann said that snow is continuing today over much of the country and has increased in intensity. Forecaster Gerry Murphy said the snow may turn to sleet and snow in coastal areas, especially in the southeast, and in the south later as milder weather pushes in. He said the snow will move further north tonight, falling over the midlands and north of the country. Minister for Housing, Planning and Local Government Eoghan Murphy has said that just because the advice to stay indoors has been lifted does not mean people should rush outdoors. Minister Murphy said Red and Orange warnings remain in place and that those warnings are still very serious. He said the National Emergency Co-ordination Group would continue to monitor events and decisions would be made to get crews to the right locations to open up routes in parts of the country where it is safe to do so. The figures from official Met Éireann stations show that between 5-12cm of snow fell up to 6am this morning. There are unofficial reports of higher amounts throughout the country. 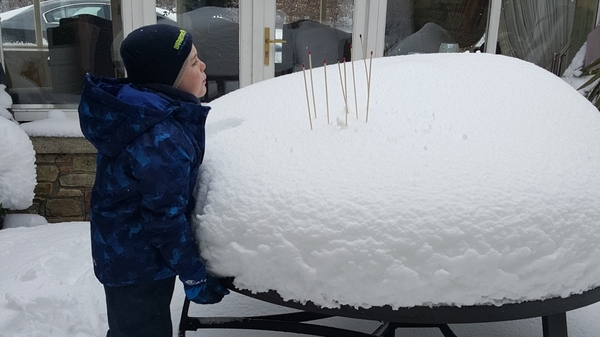 The blizzard conditions disrupted power supplies in large parts of Dublin overnight, where thousands of homes and businesses are without power, as well as elsewhere along the east coast from Wexford to Louth. ESB Networks said around 9,000 customers are without power in north county Dublin and there are ten "reasonably big" faults on the network. Crews have been out overnight, but conditions are said to be very difficult. Emergency services are still trying to assess the situation and it will be later today before the full scale of damage is known. Dublin Fire Brigade reported a very busy night, with several trucks struggling to get through the snow drifts. Met Éireann said: "Blizzard conditions will continue this morning through Leinster, Munster and parts of Connacht with further accumulations of snow in strong and gusty northeasterly winds. "The snow will be heaviest in the east and south of the country." It said the highest temperatures will be between -1C and 3C. There was no Dublin Bus, Luas, DART or Iarnród Éireann services today, although some services are set to resume tomorrow. Hundreds of flights were cancelled at Dublin Airport. Several Aer Lingus and Ryanair flights have been cancelled for the morning as Storm Emma continues to cause chaos across the country. Cork Airport, Kerry Airport, Shannon Airport, Donegal Airport and Ireland West Airport are due to reopen tomorrow morning. The HSE cancelled all outpatient appointments and non-urgent surgeries for today. It said that the National Ambulance Service is prioritising emergency calls. Schools, third level institutions and colleges of further education countrywide are closed. Jim Casey from the Office of Public Works has warned there is the potential of a sudden rise in river levels, especially on small, steep, mountainous catchments once the snow starts to melt. He said this sudden rise could catch people out. He advised the public and farmers to stay clear of rivers and water courses. Regarding south coast tides, he said the 6.30am in Cork poses a threat if there are onshore southeasterly winds. On the east coast, he said there was some very localised flooding. There is potential for similar local flooding tomorrow, he said.